1. Where can I find out what anthologies are open for submission? Glad you asked, click the Anthologies link above. 2. What kinds of products do you publish? We primarily publish books and comics featuring furry (anthropomorphic) characters. In addition to comics, we also publish a range of art books. 3. What information should my initial contact include? * On-going series, one-shot, etc. Please also include sample art from your project and/or a link where we can view your material online. For written works, please upload your full manuscript using the form below. Currently our final cut size on our comic books is 7 inches wide by 10 inches tall and our magazines are 8.5 inches wide by 11 inches tall. 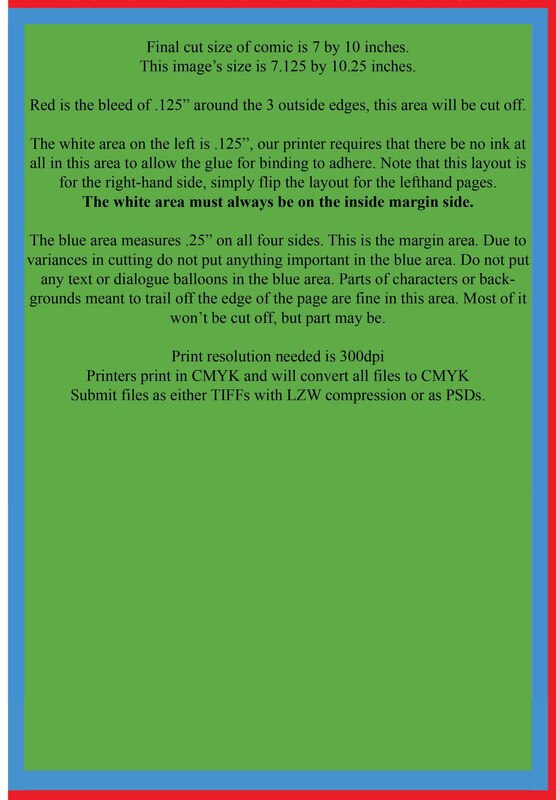 Please do not include any white border around your images as our layout already has a margin built in. For edge-to-edge printed comics, please write to discuss and that can be worked out on an individual basis. The cover size is slightly larger than the individual page size. 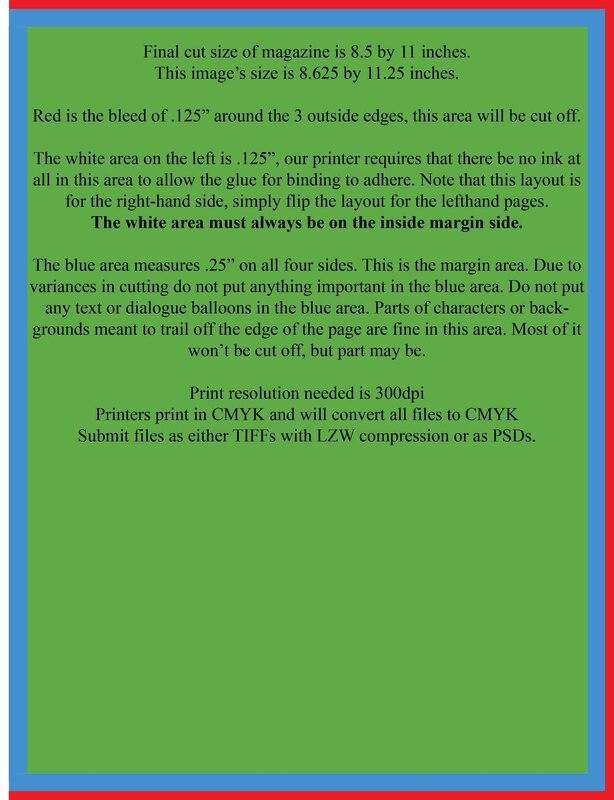 This is to allow for "bleed", the cover image should be larger than the final printed image so there is no white lines at the edges when we do the final cuts on the comic. Please draw your cover image so it can be sized to 7.125 inches wide by 10.25 inches tall. Also, please do not put any important cover elements (title logo, artist's name, issue number, etc) within .375 inches of the top, bottom or right-hand edge of the image. We need these areas to be clear of important cover elements as they will most likely be trimmed off. Please leave a space on the upper, left-hand size of the cover image to allow for the FurPlanet logo to be inserted and a space on the lower-right of the back cover for the ISBN barcode. Interior Pages: Our preferred file type for interior comic pages is .TIF with LZW compression on. For color comics, CMYK is preferred over RGB. Covers: For covers, please submit as PSDs. It is also preferred if the cover is submitted with the original layers. This will allow us to make minor adjustments to the placement of logos and text if they are too close to the cutting edge. Please submit all files in at least 300dpi. Our submission "slush" pile for written works is currently very backlogged. Due to our small staff and available time we are not actively seeking new submissions for novels or novellas at this time. If you wish to submit a short story, please check the Anthology Submissions tab above to see if any of our anthologies are currently open for submission. We pay our authors and artists royalty payments quarterly. Royalties are calculated on a per unit basis, the amount per unit sold depends on the retail price, cost to produce, type of product and method of sale (direct sale from FurPlanet.com versus through a distributor, for example). Specific royalty amounts will be discussed via e-mail once the requested information under 3. above is provided. * Work featuring underage or apparently underage characters in sexual situations. * Excessive gore, violence without a compelling narrative reason for it. If you are in doubt whether your work falls into one of these categories please feel free to run it by us before submitting your work and we'll let you know whether it's something we would consider publishing or not. NOTE: Please note that FurPlanet is operated by two people who both also have full-time day jobs. We receive a lot of e-mail from customers, artists and prospective clients. Please allow sufficient time for us to read your e-mail, evaluate the information and get back to you. Please allow at least a month for us to respond to inquiries about comics and art books. As we are not currently reviewing novel and novella submissions there is no set timeframe for a response on those inquiries. Thank you.